This bhel is some thing that I wanted to recreate from memory. 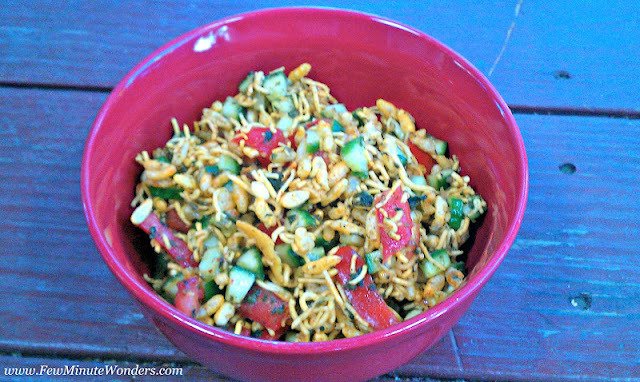 My uncle used to treat my sister and me to the healthy version of bhel from street vendor. The way he had the ingredients arranged in his cart is something that I still remember. It contained veggies, puffed rice, some magic powder ( mixed spices) ,sauces, crunchy stuff like chips and nuts. He would mix all these ingredients skillfully in his steel bowl and parcel it off into paper cones. What a delight I used to experience when I took a mouthful of the bhel. After big discussion with my sister we decided on the possible ingredients he would have used. Too bad he no longer sells this in my neighbourhood to verify. But I made it 3 days in a row and in the end got it close to the vendor. My entry to Red and Green FIC Event hosted by Tasty Recipes and 15 Minutes Easy Cooking Event hosted by Indian Vegetarian Kitchen. Any other crunchy snack like mixture. 1. Cut the veggies into smaller pieces and place it in the chopper to make it into even pieces. 2. Heat the wok and roast the puffed rice if it has a smell to it or if you want to make it crunchy. 3. In the steel bowl add the puffed rice, the crunchy mixture and 1/2 the powders. 4. Add the chopped veggies and remaining powders to it. 5. Mix the veggies and puffed rice when you are ready to serve. 6. Add the sauces and crunched peanuts, chips and cilantro and serve. Looks really delicious and healthy at the same time! looks so colorful and healthy. thx for sending! Really healthy n so temptingly colorful, Thanx for sending..
Wow That is real treat! First time here, My kinda salad. Ur t&t from lisa's blog look's mouthwatering :)nice clicks too. Hmm.. coming to the bhel salad...very nicely presented recipe..great at tea time. awesome recipe........looks gorgeous!!!! Feel like having it right away! just saw that u live in san diego.. i have lived there for 5 yrs.. now we moved to La.. we were in rancho bernardo. just dropped a comment to say a hi.. Very healthy and nice recipe. You have a nice blog.